The engineers at Dassault began work on an a fighter-bomber version of their Mirage III not long after the Mirage IIIC entered production. One distinctive update was a small fuselage plug behind the cockpit to enlarge the avionics bay and fuel capacity. This change launched the highly successful Mirage IIIE. As with most new high-performance aircraft, Dassault produced a two-seat trainer version of the Mirage IIIC which was designated as the Mirage IIIB and the Mirage IIID trainer for the Mirage IIIE series. As with their single-seat cousins, the two-seaters receive additional letters in their designation to signify the user and configuration of each sub-variant. Kinetic Models has followed up their releases of the Mirage III single-seaters with this kit of the two-seat Mirage IIID series. While Heller had produced the Mirage IIIB in 1/48 scale, the only option until now for the D-series was to use an aftermarket conversion on a single-seat kit. Like the previous Mirage releases from Kinetic, this kit is molded in light gray styrene and presented on six parts trees plus one tree of clear parts. Five of the trees are common with the previous releases, while the fuselage tree and the clear tree are newly tooled to replicate the two-seat airframe. These decals are designed by Syhart Decals and printed by Cartograf. The sheet includes a nice suite of airframe stenciling with unique stencils for each nation also included. Painting instructions are provided using Ammo by Mig Jimenez colors though a table up front provides Vallejo, Gunze, Tamiya, and Humbrol equivalents. 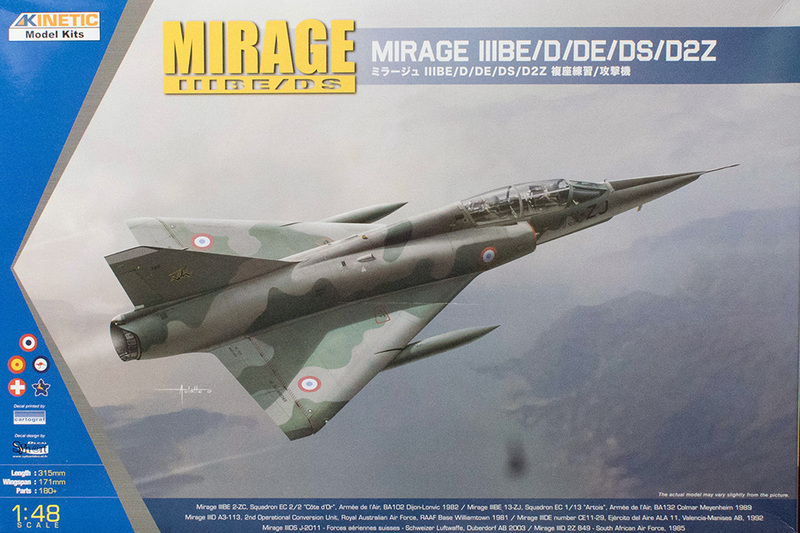 This is another very nice release from Kinetic and adds the later Mirage IIID options to your 1/48 scale flight line straight out of the box.